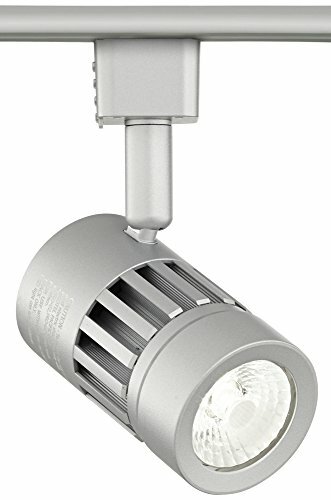 This energy-efficient LED grooved track head is crafted from aluminum and comes in a sleek silver finish. It features an adjustable head and swiveling arm that allow for 350 degree rotation and a 90 degree pivot. This dimmable design is comparable to a 50 watt halogen bulb. For use with Juno track lighting systems - track applications only; not compatible with mono point applications. - 3 3/4" high x 2 1/4" wide. Extends to 5 1/2" when aiming straight down. - Uses 8 watts to produce a 560 lumen light output, comparable to the output of a 50 watt halogen. 2700K color temperature. 80 CRI. - Cree Xlamp LED grooved track head for Juno track lighting systems. - Silver finish head with nickel finish arm; adjustable head and swivel arm. - Dimmable to 10% with an electronic low voltage dimmer, or an LED rated dimmer. - Compatible with Juno track lighting applications only; not for mono point applications. - LED averages 30,000 hours at 3 hours per day. - 120 volt; 350 degree rotation; 90 degree pivot; 38 degree beam angle. 3 3/4" high x 2 1/4" wide. Extends to 5 1/2" when aiming straight down. Uses 8 watts to produce a 560 lumen light output, comparable to the output of a 50 watt halogen. 2700K color temperature. 80 CRI. Cree Xlamp LED grooved track head for Juno track lighting systems. Silver finish head with nickel finish arm; adjustable head and swivel arm. Dimmable to 10% with an electronic low voltage dimmer, or an LED rated dimmer. If you have any questions about this product by ProTrack, contact us by completing and submitting the form below. If you are looking for a specif part number, please include it with your message.